Nitrates are a broad class of chemicals and salts derived from nitric acid. They are easily dissolved in water; sodium nitrate is commonly used as a food preservative or to “cure” foods such as bacon and other preserved meats. Other types of nitrates are also commonly used as fertilizers can be found in rodent poison, septic facilities, and even explosives. Some nitrates occur naturally in the environment, where they can be found in the atmosphere, soil, freshwater, seawater, and mineral deposits. The two most common ways people are exposed to nitrates is by drinking contaminated water, usually in private wells, or by consuming foods containing preservatives, including hot dogs and lunchmeat. Some vegetables such as cauliflower, root vegetables, collard greens and broccoli also have nitrates present in them. According to the Environmental Protection Agency, exposure to high levels of nitrates can result in serious complications, particularly for infants. When infants are exposed to high levels of nitrates, it can interfere with how oxygen in the blood is carried to the body. This can result in an acute blood disorder known as methemoglobinemia, or “blue baby syndrome.” Methemoglobinemia can be fatal. This adverse health effect is most commonly seen in infants who are exposed to nitrates in drinking water that is made to prepare formula, usually from a private well. Infants under the age of 3 months are the most likely to be affected by blue baby syndrome, because the normal flora found in their intestines promotes the generation of methemoglobin, a compound that reduces the ability of blood to carry oxygen to the body. Infants who develop blue baby syndrome will typically have a blue discoloration to their skin, particularly in their ears, lips, and nose. In mild cases of this condition, simply removing the nitrate-contaminated water will be enough to resolve blue baby syndrome, but severe cases will require medication. Adults and children can also develop methemoglobinemia, but they must be exposed to much higher levels of nitrates. The Environmental Protection Agency (EPA) mandates that municipal and city water must contain less than 10 parts per million of nitrate. The American Academy of Pediatrics recommends that private wells that are used by children should be tested regularly for the presence of nitrates. Nitrates are chemicals that easily dissolve in water; they are converted to nitrites by the body. Infants who drink formula prepared from water containing high levels of nitrates are at risk for methemoglobinemia, or blue baby syndrome. 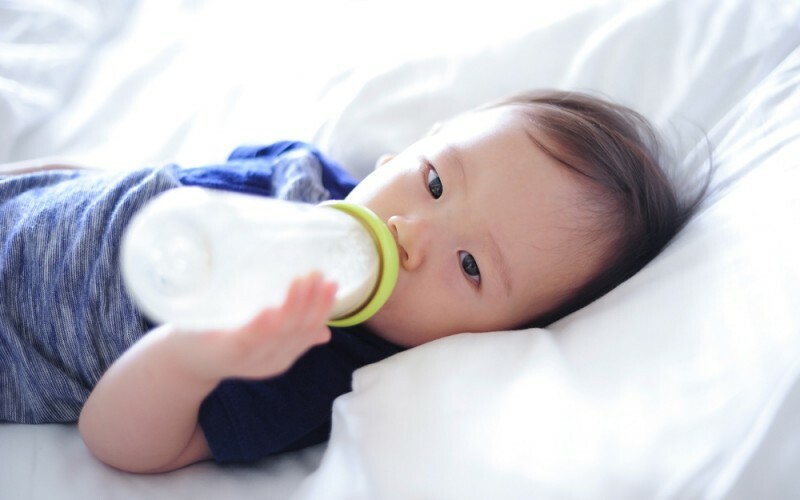 When unsure of the quality of water, it is best to use bottled water to prepare infant formula. Environmental Protection Agency. Consumer Factsheet on Nitrates/Nitrites. Environmental Protection Agency. U.S. EPA, Toxicity and Exposure Assessment for Children’s Health. New Hampshire Department of Environmental Services. Nitrate and Nitrite: Health Information Summary.